I’m sure you’ve noticed, but it’s worth saying that American life has changed a lot in the last 10 years. The rise of the internet age and the addition of mobile devices has impacted the way we work, shop and socialize. The needs and demands of consumers have changed profoundly and any industry that wants to attract and retain customers will need to keep up. Including healthcare. Fortunately outpatient clinics have a powerful tool at the ready that can deliver health services to customers in a way that fits in with their lives and improves practice efficiency without sacrificing reimbursement. Telehealth. Let’s look at a couple of situations where telehealth technology might play a role in patient care and satisfaction. Bob is a 35 year old marketing executive who tries to play basketball like he’s 23. One day, he tripped and badly jammed his right index finger. It was hurting and very swollen the next day so he made an afternoon appointment with his doctor. After x-rays she determined that it was indeed broken and prescribed a splint and an icing regimen. She asked Bob to return for a follow up appointment in 2 weeks. He made the appointment and left. On the day of the appointment Bob’s finger was still really bothering him. The swelling had gone down, but it still hurt and he couldn’t move it well. There was a major crisis at work that morning and Bob’s boss was in a very bad mood. Bob decided that his finger just needed more time to heel and it wasn’t worth missing the hour and a half (at least) it would take to get to his appointment and back. Not on this day. Bob canceled his appointment. Six weeks later, Bob’s finger had not improved. He made a new appointment during which, his doctor scolded him for not following up sooner. She determined that there must be some ligament damage and ordered physical therapy. Only after 4 months did Bob’s finger feel close to normal, but his full range of motion never returned. What if the outpatient clinic that Bob used had telemedicine? Instead of making a follow up appointment after his initial diagnosis, Bob made an appointment for an online live video chat with his doctor. The day at work was still terrible, but all Bob had to do was shut his office door at the appointed time, pull out his iPad and login to a telehealth portal. There he could see and hear his doctor, describe how his finger felt and demonstrate his range of motion. She could determine that it wasn’t healing well for a simple break and get his physical therapy started right away before there was a risk of permanent loss of range of motion. This would be a better outcome for Bob and a better outcome for his doctor who would be reimbursed for the telehealth visit and avoid a canceled appointment on her books. Alice is a 32 year old mother of 2 who has been suffering with depression for a couple of years. Her husband finally convinced her to speak to her doctor who prescribed an anti-depressant and explained that getting the right drug and dosage to treat depression is tricky and often requires multiple adjustments. He asked her to come back in 4 weeks to see how things were going. Alice took the medicine, but not much happened. Her mood didn’t improve. She did get a really dry mouth, which was annoying. The day before her follow up appointment one of her girls was diagnosed with strep throat. She was feeling stressed, the pills weren’t working anyway and she didn’t need to drag a sick kid anywhere. She canceled the appointment. It was a year before she decided to try again. What if Alice’s doctor handled medication checks with secure video conferencing? Like a lot of depressed people, Alice wasn’t able to make it into the office in the face of the obstacle of a sick kid. But what if all she had to do was log on to her laptop and access an easy to use interface that let her connect with her doctor without much effort at all? In a 15 minute conversation, he might have acknowledged Alice’s frustration, given her some needed encouragement and adjusted the dosage appropriately. Alice gets relief faster and some helpful support and her doctor is able to improve his patient’s outcome efficiently and cost effectively. These are just a couple of stories that illustrate how the convenience and simplicity of telehealth technology offers advantages for patients and care givers alike. It fits beautifully with how modern Americans manage their lives and gives providers an alternative that makes them more profitable. It’s pretty rare to find such an effective win-win solution. 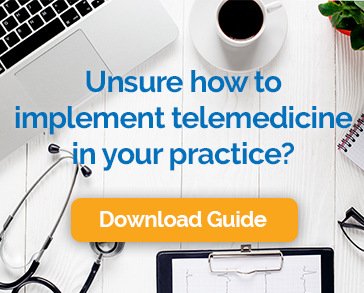 If you’re interested in more telemedicine case studies, check out our white paper: Telemedicine Clinical Case Studies – How telemedicine can be used in outpatient care.